With his gift of discernment Elder Porphyrios got to know another great Elder of our days, the Russian Starets Sophrony, founder and first abbot of the Holy Monastery of the Forerunner in Essex, England. He wrote many books, among them being the internationally famous, Saint Silouan the Athonite, which has been translated into many languages. 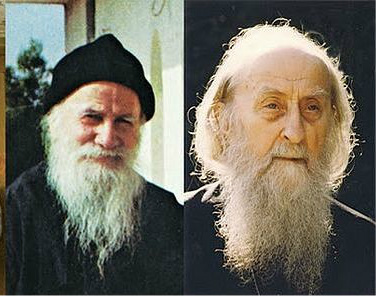 Elder Sophrony lived with Elder Silouan, who was proclaimed a saint in 1987, for nine years. In November 1990, we had the privilege of meeting Elder Sophrony in Essex and talking to him. He told me that he used to meet Elder Porphyrios in prayer every night. They each knew what the other one looked like, even though they had never seen one another with their physical eyes. Elder Porphyrios had never seen Elder Sophrony, and vice versa. This unbelievable story was related to us by Elder Sophrony, in the presence of Archimandrite Kyrill, the Abbot of the Monastery in Essex, Hieromonk Zacharias, the spiritual father of the Monastery, and three spiritual children from Cyprus. "And proclaim to the peoples that I have not died but I live forever and I proclaim the afflictions of the Lord Who crowned them." From the book Elder Porphyrios: Testimonies and Experiences by Klitos Ioannides. "Do they really write such glowing reports about me? How can I say that I am that kind of person? To write such things about myself would be strange. The facts are as follows: About ten years ago, at the request of Fr. Porphyrios and through the efforts of a mutual friend, a date and a time for mutual prayer was set for both of us. From that moment on, we began praying for one another." In fact, some of the people at the Convent remember that Elder Porphyrios had asked them not to disturb him at a certain hour because he then had a spiritual meeting in prayer with Elder Sophrony. Elder Porphyrios would also have these spiritual encounters with his spiritual children who lived far away. I embrace you in Christ. A certain person told me that you would like to have us meet; that you've invited me to come to England and if I cannot go there, you will come to Greece. Since it is impossible for me to come, and I do not wish you to go to the great trouble of travelling here, and since Christians cannot be separated by distances, we could meet one another in prayer by saying, 'Lord Jesus Christ have mercy on me,' on Sunday, 31st August, 1980, from 12:00 to 12:30 after midnight (10:00-10:30 English time). Unless you have business which brings you here to Greece. I embrace you in the Lord along with your brotherhood and I wish you health in soul and body.